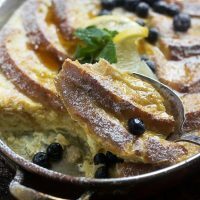 This delicious and easy Baked Lemon French Toast is a perfect weekend breakfast treat, or ideal for the brunch table! No overnight refrigeration needed. 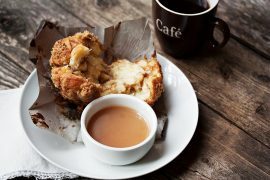 If you’re looking to brighten up your weekend breakfast, you may wish to consider this easy, delicious french toast bake. No overnight refrigeration is needed. This one comes together quickly and easily. Just let stand about 20-30 minutes before popping in the oven. 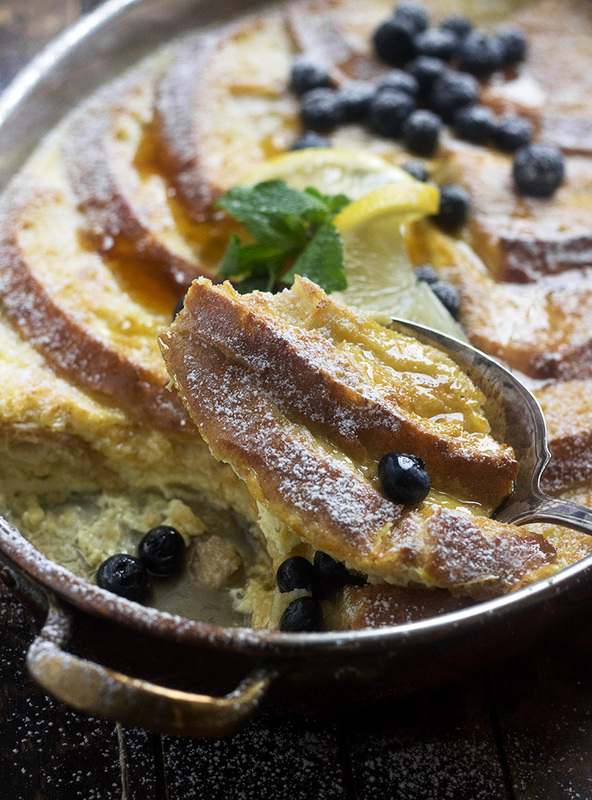 Then enjoy the lovely lemon french toast with a drizzle of maple syrup and some berries. And while I just said you don’t need to start it the night before, if you really want to, you certainly can! Just take out of the fridge and let stand for 30 minutes before baking (to take the chill off it a bit). Certainly a handy option for entertaining. You can really use any bread you like for this french toast bake, but do make sure it’s not super fresh. Day old, ever-so-slightly stale bread is perfect. I have set slices of bread on a cooling rack to stale up a bit if it seems a bit too fresh. It doesn’t take long and will help the bread keep it’s shape as it bakes. Challah bread would be perfect for this dish. I can never get my hands on challah (unless I make it myself), so I used a round loaf of artisan bread, with wide slices that I cut in half in the middle and over-lapped slightly. Try to keep the bread as flat to the bottom as possible, overlapping only slightly. It’s important that most of the bread is submerged in the liquid, with only the very top edges exposed. You may not need all the soaking liquid, as the amount needed will vary depending on the type and thickness of the bread used. I used an oval copper pan here, but any baking dish of similar size or a 9×13 baking dish will work just fine. 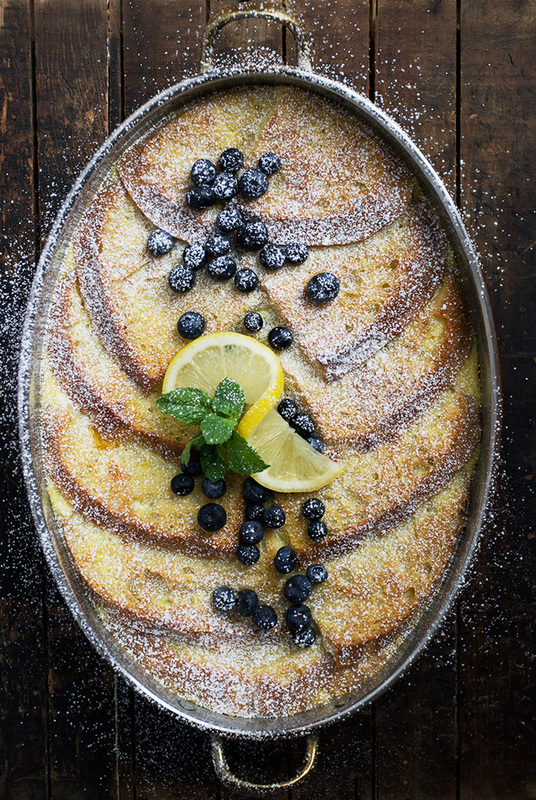 I love this lemon french toast with fresh blueberries, but blackberries or raspberries would also be lovely. Don’t forget the drizzle of maple syrup. The combination of flavours with the lemon is fabulous! 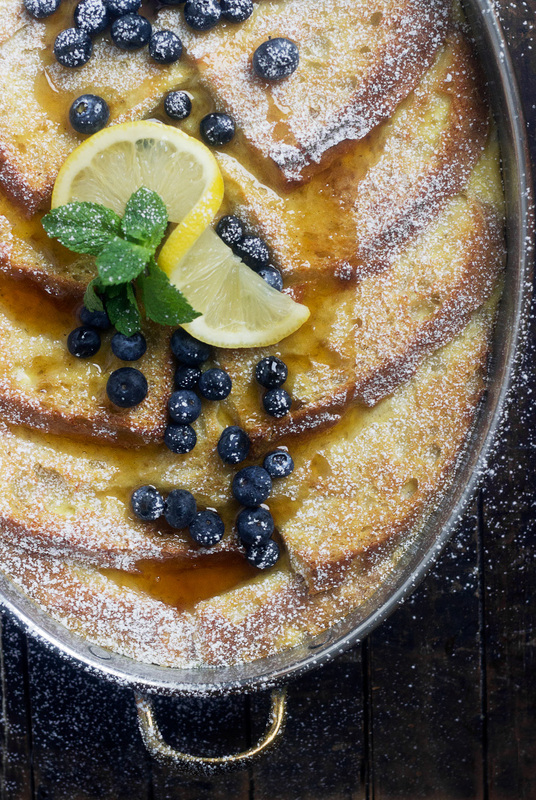 Delicious and easy lemon flavoured baked french toast. Perfect for a weekend breakfast or great for entertaining. 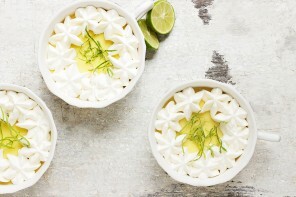 In a medium bowl, whisk together the eggs, half & half, milk, vanilla, lemon zest and brown sugar. *Note: You may not need to use all of the soaking liquid. 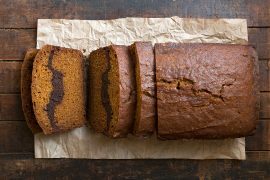 A lot will depend on the thickness and type of bread you are using. Pour mixture over bread slices only until the bread is almost all covered, with only the top edges of the bread slices exposed. Use a fork to gently move the slices so that the soaking liquid seeps between the slices, as well. Allow to stand at room temperature for 20-30 minutes, pressing down with a fork and adding a bit more of the soaking liquid if necessary, once some has been absorbed by the bread before putting in the oven. 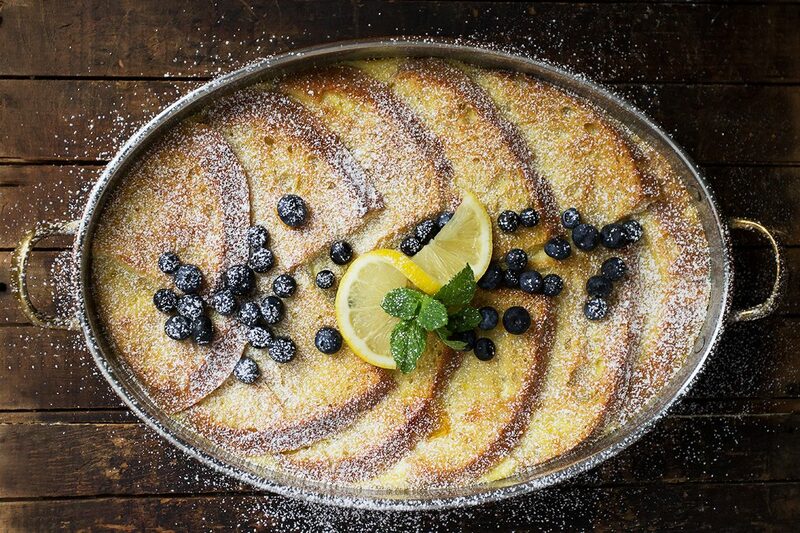 The lemon French toast looks delicious. What size is the baking dish? Hi Terrie, The one I use is a 9×13-inch oval, so anything in that size range would work. I ran across this while surfing the web for recipes by Thomas Keller. I’m glad I saw this recipe first. This is such an easy recipe with many ingredients right at home. I bake homemade sourdough bread “a Lot.” I keep my sourdough starter in my fridge and feed it every week. It is yummy with this recipe, Jennifer! Thanks again! My husband absolutely loves French Toast any day of the week! He also planted lemon trees, along with some other fruits, 21 years ago in our garden. The lemons are huge, the tangelos & tangerines are sweet and juicy. As well as the apples, persimmons, strawberries and blueberries. And that is only the fruit! The man has a green hand instead of a thumb, lol. This recipe is a perfect surprise for him. I can already tell you thank you from him. Thanks so much, Jennifer! I am in awe of all the wonderful fruit you can and are growing! I can’t even imagine having all that in my back yard :) Do enjoy this French toast! This is such a yummy morning treat, how can I NOT make it?! Oh my gosh!! Lemon, berries, maple syrup? I’m dying over here! All my very favourites and I start to get such cravings for lemon and limes about this time of year. It’s the Spring calling to me. Mmmm I wish I could have a big serving of this for breakfast this morning! Such a perfect fruity + indulgent breakfast treat. Love your photos, too! First of all Jennifer, that sounds like the most delicious french toast ever! And it has to be the prettiest too! I can’t wait to try! I’ve got a loaf of challah bread, and I’ve got a bag of Meyer lemons waiting in the kitchen, guess I know what’s for breakfast this weekend! She would love this, Chris! Thanks Tricia. 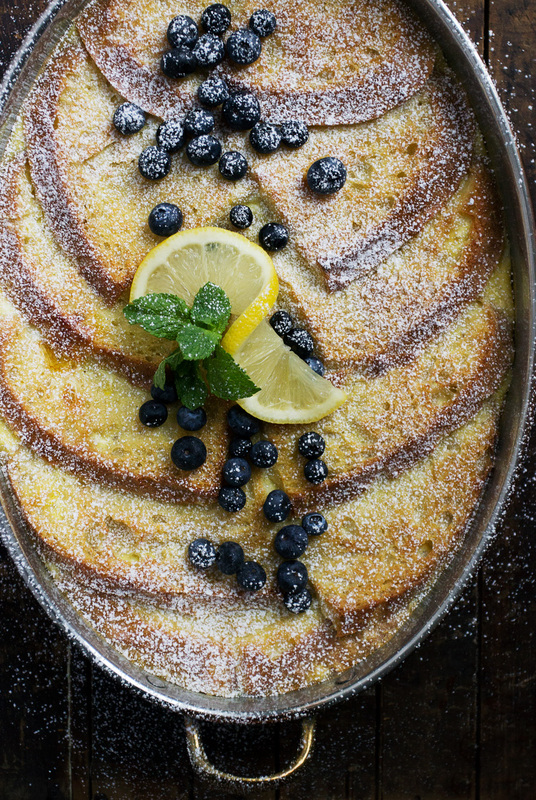 I love the ease of baked french toast and this lemon one has become a quick favourite!